The Online Archive of California is a part of the California Digital Library, based out of the University of California. The OAC is a digital archive that enables users to access manuscripts, photographs, and works of art held in libraries, museums, archives, and other institutions across California.. 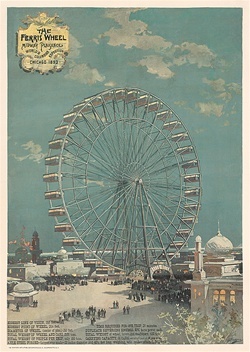 The site is not dedicated specifically to the World’s Fair, but hosts a number of collections with images and texts related to the topic. The OAC enables users to browse using keyword or topical searches. This online exhibit was created by Julie K. Rose as a complement to her master’s thesis in English at the University of Virginia. It was created in 1996 and does not appear to have been updated since it was launched. 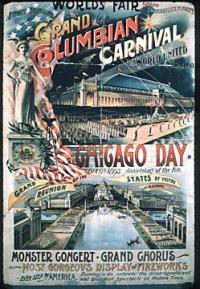 The site includes a brief history of the World’s Fair (or the World’s Columbian Exposition) held in Chicago in 1893. In addition, the site offers a description of the fair, reactions to the fair, the legacy of the fair, and links to resources. This site is dedicated to fans of the World’s Fair, it was launched in 1998 and has been updated every few years, with recent additions including a blog and plans for a podcast. The Expo Museum’s goal is to celebrate the World’s Fairs of the past and to assert that World’s Fairs are still important to a contemporary global community. The Expo Museum is meant to be a place to learn and share about the World’s Fair and the creator, Urso Chappel, hopes that this website will pave the way for a future, physical museum, similar to the Olympic Museum in Lausanne, Switzerland. The Online Archive of California (OAC) is a digital information resource that provides access to manuscripts, photographs, and works of art held in libraries, museums, and archives throughout California. The site is meant to provide broad access to students and scholars who would otherwise have to travel to individual institutions. As an online archive, the site seeks to provide both high and low-resolution images and complete metadata for each item. In addition, the OAC includes a collection of finding aids, which were not referenced for the purpose of this project. This site does not explicitly state its goals, but we can surmise that Julie K. Rose created it to circulate her master’s thesis and to serve as a resource for students and scholars interested in the 1893 World’s Columbian Exposition. Rose designed the website to look like a scholarly essay and the intended audience is expected to approach the site much like it would a book. The range of materials is very narrow. The site includes a timeline of World’s Fairs, but some fairs are missing from the timeline and only a few have links to further information. The main materials on the site are overviews of a handful of fairs, which are described in further detail below. Otherwise, the ExpoMuseum serves simply as a node for other websites that have information about the fair such as Answers.com, online stores, universities, and public libraries. The OAC offers a broad range of materials, including diaries, letters, photographs, paintings, posters, newspaper articles, personal narratives, oral history transcripts, scientific logbooks, electronic records, sound recordings and ephemera. See texts and images for further examples. This site offers only one primary source material- a map discussed in further detail below. The site is essentially a thesis decorated with images, borrowed under fair use, from other websites. Rose offers her interpretation of the 1893 World’s Exposition- providing a brief history of the World’s Fair and presenting her research on the motivations behind the exposition and the aftermath of it. The best resource offered by Rose is the comprehensive bibliography on the Notes page. This site is sponsored by The Expo Museum, the official online museum for the World’s Fair and the personal project of Urso Chappel. The conception and planning was done by Chappel, a graphic designer for the World’s Fair and a World’s Fair enthusiast, who created and continues to maintain the site. It is essentially an online exhibit for other fans and enthusiasts with numerous links to related online essays, exhibits and stores. This audience is supported by including interactive functions such as a discussion board, yahoo group and blog on the site. The OAC was designed for students, teachers, and researchers. It is part of a broader project titled the California Digital Library, an effort based out of the University of California to support the assembly and use of scholarship and knowledge. As mentioned above, it seems that Julie K. Rose created this website in 1996 to circulate her master’s thesis in English from the University of Virginia and to serve as a resource for students and scholars interested in the 1893 World’s Columbian Exposition. Rose does provide information about the creator and date created at the bottom of each website page, which is useful for researchers, although the link to her personal page no longer works. The user has no ability to interact with documents or objects. There are a handful of images that decorate the Overview pages for selected World’s Fair (see Paris for example). Otherwise this site is meant as an online exhibit, for casual browsing and there is no capability to view or manipulate documents or images. The user can search for documents and images through a number of channels (see the following section on searchability). Once a user selects a document or image, s/he is presented with a low-res scan, which loads quickly, and some brief information including the title, date and contributing institution. The user then has the option to enlarge the image, view a printable image (with or without metadata details) or find out more information about the document or image. The more information section provides metadata using the Dublin Core Standards- including title, description, identifier, language, collection and copyrights information, etc.. This final piece of information is particularly useful as the documents and images come from all over California. The rights section instructs the user exactly who to contact regarding use. For text only, the user also has the option to zoom in on and rotate the image, using imgzoom. There is a single primary source document included in the site. It is a map of the 1893 fairgrounds, which the user can click to enlarge. Other than this, the images are merely thumbnails, borrowed from other sites. The essay includes a sprinkling of in text citations, but these are without hyperlinks that would prove beneficial to connecting the user with the source text. The seemingly easy navigation system, a timeline with points for each worlds fair, turns out to be a web of confusing, interlocking, overlapping links. For example, clicking on the memorabilia section you encounter what appear to be broad categories (i.e. books and brochures) but these turn out to be a single link back to the overview pages, which you previously scanned using the timeline and which have no relation to the said category. The overview pages are perhaps the most helpful sections of the site. They provide information about opening and closing dates, attendance figures, an image from the fair and links to additional resources. However, if you stray from these pages, you are likely to end up in Amazon.com or Posters.com wondering how you arrived. That aside, the sidebar navigation is easy to use and the user can jump between the timeline, the store, and the discussion board with ease. Chappel also includes a site map which lays out very simply the structure of the website and is another good option for users wishing to navigate the site. The OAC enables users to browse using keyword or topical searches. Searches are segregated by “text” or “image.” I found this useful because I was looking primarily for images, but some researches might be frustrated by the fact that they have to conduct two separate searches, one for text documents and one for images. While there is only a simple search option, the site does provide a list of tips for searching. You can also browse through images and documents by broad categories such as people, nature, history, society and places. These categories are broken down into more specific topics. People, for example includes over 100 sections on race, age, gender and occupation. Each component of the site has explicit directions, links direct you to high res scans, printer friendly options, more information about the object. These guides help direct the user through browsing options. The main browsing option is to use the toolbar at the bottom of the page. This includes links to home, welcome, tour, reactions, legacy and notes. These fields match nicely with the themes of the paper, however, their location at the bottom of the page, means that the user is constantly scrolling down massive text blocks to tab to the next section. There is no searching option or site index included on the site. This is the biggest downfall of this website, for without easy searchability the user is left to wade through pages and pages of text to find what they are looking for. This site gets a high rating for enthusiasm, Chappel clearly has a passion for the World’s Fair and makes a good effort to share his passion with the world. However, the site is significantly lacking in content and the referenced links turn out to be shopping opportunities more often than learning opportunities. Clearly, the site is driven by the interests of Chappel more than the pursuit of a historical accuracy. And because the site’s goal is not education-based, rather it lives in the world of fan appreciation, perhaps this lack of content is acceptable. Nonetheless, the site would benefit from better searchability and perhaps links to Amazon.com and Posters.com could be moved to the ExpoMuseum Store page, instead of locating them in the further resources section. Overall, this online archive provides a broad range of sources that are easily searchable. Students and researchers of many ages would be able to use this site to search for texts and images. My biggest criticism is the fact that the images are saved as .htm which makes it difficult for a user to download them and manipulate them for use in a paper, exhibit, etc. Otherwise, the site receives high ratings for searchability, content and range of materials. This site is essentially a thesis pasted on a website. It serves its purpose- to provide an interpretation of the idea, experience and aftermath of the 1893 World’s Columbian Exposition; however, the outdated site design and text heavy pages, lower the site’s usability. The lack of searching options also makes this site difficult to navigate. While the site does provide some useful content and a comprehensive bibliography for students and scholars interested in the topic, it essentially offers an example of what not to do when translating scholarly papers to the web. The lack of interactivity and searchability leads to an overall low rating.